AeroShot™ Energy, Cambridge, United States - "The energy of the future is here." AeroShot™ Energy - "The energy of the future is here." The energy of the future is here. AeroShot Energy is a revolutionary new way to get your energy. It’s an air-based boost of energy delivering a unique blend of 100mg of caffeine, equivalent to a large cup of coffee, plus B vitamins that starts working right away – anytime, anyplace. AeroShot’s patented delivery system is designed to work, fast, anywhere. It’s quick to use, quick to take effect and the lipstick sized device is highly portable and efficient, with just the energy you want and none of the other stuff. There are no calories to fill you up. No liquids to slow you down. And no mystery ingredients found in most energy products. Launched in 2012, AeroShot Energy comes in three delicious flavors - lime, raspberry, green apple. AeroShot is easy and fun to use. Pull the cap to open, put the other end in your mouth, gently draw the powder into your mouth and swallow. Push closed. Each AeroShot delivers about 4-6 draws. Use it all at once or use some now and save the rest for later. Whether for travel, before working out, staying focused at work, or performing activities unsuitable for liquids, AeroShot provides a safer, healthier, and more convenient alternative to the dizzying array of energy drinks and shots. 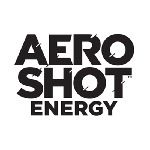 AeroShot is now available online at www.aeroshots.com and in over 15,000 convenience stores all across the country including 3000 Circle K stores. In Q4 of 2012 AeroShot will also be available in over 7000 CVS stores nationwide. Customers who want to make sure they never run out of this revolutionary new way to get their energy can subscribe to the AeroShot Renewable Energy Program. This program allows subscribers to get up to 5 sixteen (16) packs of AeroShot Energy on a monthly basis. Customers who subscribe to the program via the company website receive a special gift, the AeroChute dispenser. Writer, creator, and Harvard professor David Edwards invented AeroShot through AeroDesigns. AeroDesigns (www.aerodesigns.com) is pioneering air-based delivery systems to reimagine the consumption of food, nutrients and medications. AeroDesigns was founded in 2010, is based in Cambridge, MA and is ArtScience Labs inspired. ArtScience Labs (www.artsciencelabs.org) is a network of three small creative labs founded and managed by Dr. David Edwards (www.davidideas.com) in the USA and France. At ArtScience Labs, cultural experiments at frontiers of science with leading artists, designers, engineers, scientists and students produce works of art and design that are exhibited in educational, cultural, and commercial galleries.